Globestock stock high quality safety harnesses for working at height and confined space access. Three versions are available: Single Point, Two Point and Rescue. Safety harnesses are an essential part of our product range, enabling users to be safely and securely attached to our range of fall arresters, lanyards and personnel winch products. Recommended maximum user weight: 150kg. Standard size is supplied unless otherwise specified. Colours may vary. Single-point full body safety harness suitable for general work applications where there is a risk of falling. One rear ‘D’ attachment point between the shoulder blades. Globestock’s two-point safety harness is fitted with front and rear ‘D’ attachment points. The front ‘D’ has been specifically designed to ensure an even force distribution when under load. Has all the features of the two-point harness but comes with an additional rescue strap for use in confined spaces. 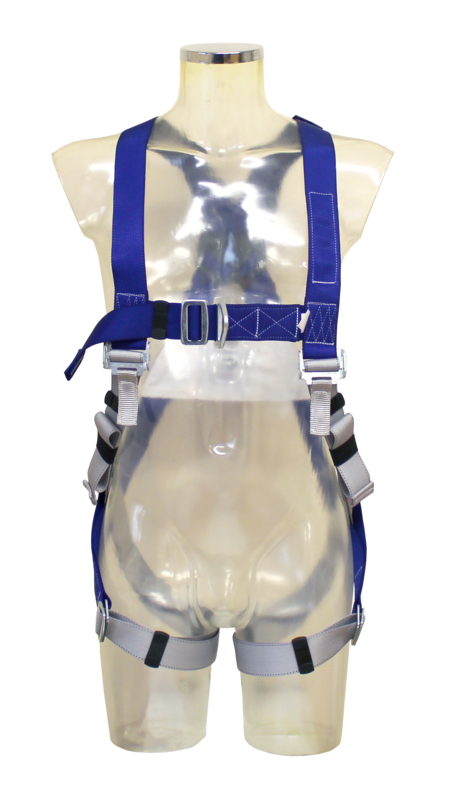 The rescue strap allows the user to be lifted in a close to vertical position, which is preferable when recovering a casualty. Conforms to European Standards EN1497.